Editor/Author Leonard, Bill J. and Crainshaw, Jill Y. 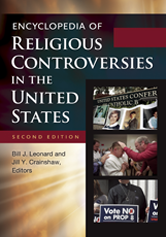 This book provides a thorough introduction to historical and contemporary issues in American religion, tackling controversial hot-button topics such as abortion, Intelligent Design, and Scientology. Preus, Jacob A. O., Jr.